I finished “playing” Universal Paperclips last weekend. This is a “cow clicker”, also known as an incremental game. 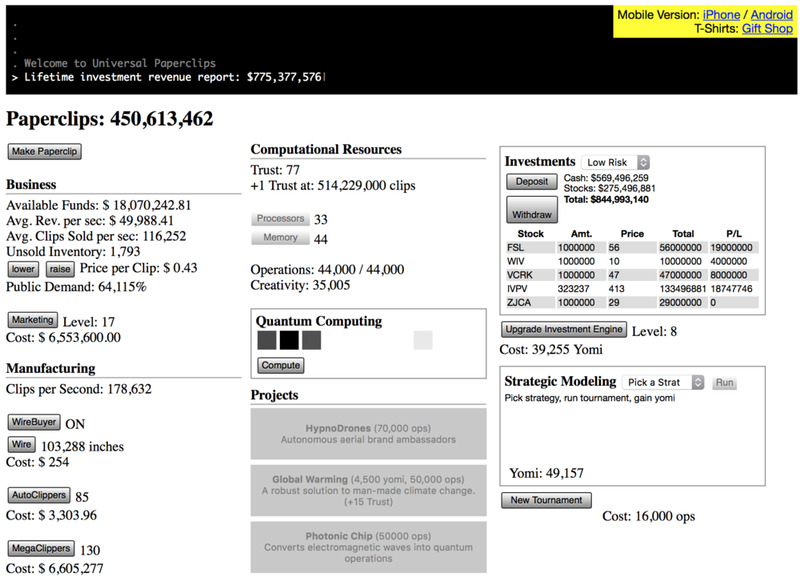 Incremental Games often start out as web sites or web apps. Popular ones might make their way into an app store where you can pay for the opportunity to simulate work. I’ve played a number of these, Cookie Clicker, SpacePlan, one based upon particle physics that I can’t remember…they all have this common theme. You start with something innocuous like making paperclips, or baking cookies, or reactivating your space probe with a potato-battery. Each of these actions are simulated by a single click of the mouse. Click - you get a cookie. Click - you get a paperclip. As you click, things begin happening. You click enough cookies, you can buy a clicker to click for you. Keep it up, and you’ll soon have an army of grandmothers baking cookies. And then it gets weird. 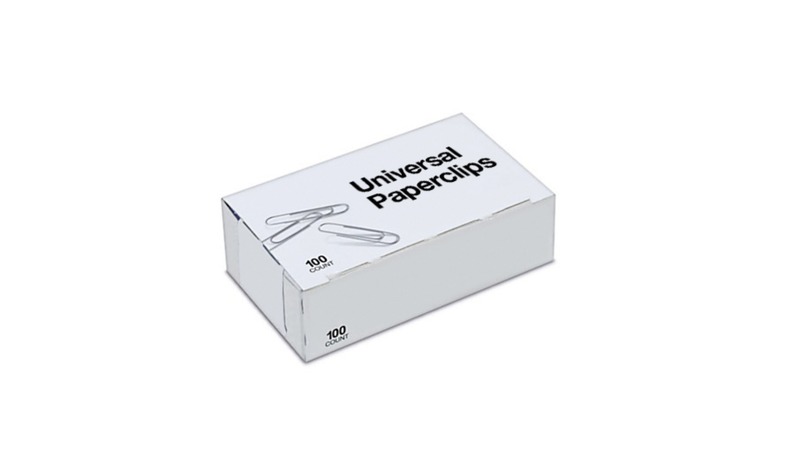 “Universal Paperclips” works the same way. Make some clips, sell some clips, buy an auto-clipper, sell some more clips, buy a tool to automatically buy more wire. Soon you’re investing in quantum computing. This game is an exercise in minimalism. While the visual aesthetic is “old fashioned internet” and pretty minimal, that’s not really what I mean. The game - in as much as it is a game - is a minimal pavlovian experiment. Proper actions are rewarded. Improper actions are not. The game logic or internal mechanics ultimately become management of an artificial resource. In this case you can trade paperclips and money for computer operations which you can trade for machines that make more paperclips and money. After a while the reward for clicking goes away, and the game becomes fountain of streaming numbers, getting ever larger and more and more ludicrous. Adjusting this or that changes your flow of the fountain. And then the space combat begins. That’s the other aspect of these games that makes them work - the innocuous activity ultimately reveals something wholly opposite. Click enough cookies to reveal an eldritch horror. Make enough paperclips, and you create an artificial intelligence that consumes the universe. Universal Paperclips is an unfolding epic story told through a silly game mechanic that pulls you in with pavlovian trickery. Universal Paperclips is evil, but is it art?